We are currently a couple days into our 4th week here in Lake Karapiro, with 7 weeks to go. When I last updated, we were just coming up to our first Winter Series Regatta where we had a fill-in to the boat because of an injury. Winter Series was hugely successful in that we got some real racing practice and it emphasized our work-ons for the coming weeks leading into the next Winter Series, one being keeping all our boys in the boat. Last week we had another major step in training load going over 200km of rowing throughout the week, along with about 150 km of cycling to and from trainings. Unfortunately with the load came the rain and wind, which resulted in some incredibly sore bodies. But it was an incredibly significant week for our boat last week making some positive technical changes as a crew and it directly affected the rhythm and pace within the boat, which makes my job in stroke seat that much easier. A bit of a mix up, but it was done to try and maximize the potential of each rower to result in better boat speed. We have another 140 km of rowing to come this week and I can’t decide quite yet whether I am excited or not… But I am glad the boat is moving faster, making those kilometres go past that much faster. I have also been using the physio help that is provided by Rowing New Zealand to help with my flexibility through my shoulders: they have given me some exercises to aid those problems. Although they suggest acupuncture I am not sure if I’m up for facing the needles. Finally, thank you all again for the ongoing support it really does mean a huge amount and I’m looking forward to putting my best foot forward for the World Champs. 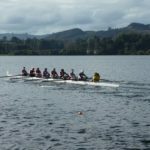 We are into our 7th week of the 11 week training campaign at Lake Karapiro. We are in the middle of our biggest volume part of training, last week being the biggest so far rowing over 230km, and this current week (weather permitted) we should clock up an extra few km’s. As the departure to Plovdiv gets closer, all aspects of the rowing scene has tightened up and we have to be very switched on, whether it be hygiene, nutrition, sleep, stretching, etc. We can’t afford to have any time out of the boat and every session is slicing down time that it will take to get through the course on finals day. We have also been briefed about the course, hotel and arrangements that come with the competition. So far it sounds like an amazing course, one with warm water, warmer weather and commonly has a slight tail. So the opportunity is there for a world record. This week has been affected by the weather, the wind has come in and put a lot of boats off the water, but not us. We have battled through to practice in the rougher conditions. If there’s a possibility of racing in it, we will train in it. 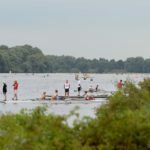 We’ve also been training alongside the U23 Men’s Eight and they have provided an excellent training partnership that benefits both crews in the way of solid competition for training exercises. No one in the boat is injured and we are performing well above our means and are planning on moving forward. Touch wood. Again, thank you for the support and I hope to make you all proud with the achievements I am able to accomplish with the support of yourselves.